The name American Water Spaniel is partially derived from its love for water. It is a resourceful hunting dog and expert retriever, but can also be a playful pet for the family as long as it is mentally and physically stimulated on a regular basis. While it can be timid, some may be forceful when confronted or around dogs it does not know. Most are very sensitive and eager to satisfy and learn to get along with other dogs that may be in the home. It likes to be heard and many will bark or whine and some may even drool. The American Water Spaniel flourishes in an environment where time is split evenly between being inside and outside. Because it is a natural hunter, it will need regular exercise on a daily basis. Taking it for a run or an extended walk will suffice. Because the coat of the American Water Spaniel can be very oily, regular maintenance of brushing the coat is necessary. This should take place approximately once a week. If hair begins to grow on the feet and topknot, it may be cut. It is important to keep a close watch on the ears and they should be frequently inspected. One of the major health concerns for the American Water Spaniel is mitral valve disease, which is a heart disorder that involves the degeneration of the mitral valve in the heart. Other minor health concerns related to the heart include pulmonic stenosis and patent ductus arteriosis (PDA). There is also a minor concern for canine hip dysplasia (CHD). Occasional health issues seen in this breed are patellar luxation that affects the knees and PRA, which is a hereditary disease. To keep it healthy, test the hips, eyes, and cardiac health of the American Water Spaniel regularly. When healthy, it will generally live for 10 to 12 years on average. To date there are no records of exactly where the American Water Spaniel came from or when. 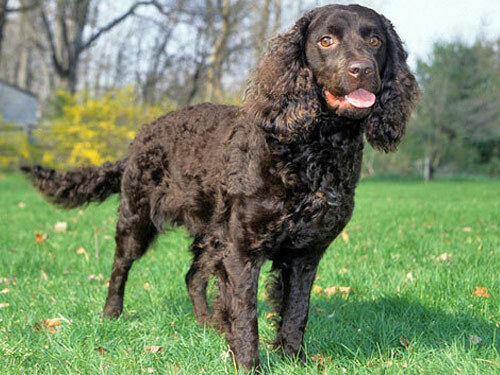 It has a strikingly similar look as the Irish Water Spaniel and may have come from that breed, but in a smaller form. Other presumptions are that it originated from the Northern, Southern, and Tweed Water Spaniels, which are earlier adaptations of the Irish Water Spaniel. Another theory is that it came from a combination of the Curly-Coated Retriever and the English Water Spaniel. There are even conjectures that the breed was created by American Indians that were located in the Great Lakes area. Regardless of which theory may hold true, the recognition of the American Water Spaniel first occurred in the Midwestern section of the United States. It was initially viewed as an excellent hunting partner since it has the ability to hunt through coarse thickets and hunt game from both the land and in the water. In fact, these dogs were used strictly for their hunting instincts up until 1940. At this time, the American Water Spaniel became acknowledged by the AKC, however it still remained a field animal. Today it has gained some recognition among the AKC breeds, however it is not as recognized at the level that it should be for being not only the State Dog of Wisconsin, but also one of only two sporting breeds developed in America.